As a woman, it is really hard sometimes to admit that I'm flawed in some areas. We all know we're flawed, we just don't talk about it. We dance around the subject in arguments with our signification others and wrestle with it ourselves but do we ever really get down to the real issues? 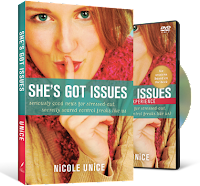 I want to share with you a new Christian book, "She's Got Issues: Seriously good news for stressed -out, secretly scared control freaks like us" by Nicole Unice. I never thought I had issues. My husband might have mentioned it a time or two, but it never clicked in my head, or heart until I started reading Nicole's book. I'd seen the symptoms in other women, but not in myself. I've officially accepted my place in the She's-Got-Issues-Club and as Nicole says "I'm in good company." Nicole takes us through the five ordinary issues that plague our lives and relationships - control, insecurity, comparisons fear, anger along with unforgiveness. Though, you may not experience issues in all of the areas, some more than others may resonate with the reader. The format of the book is very appealing, especially for busy women. The book has 14 chapters with at least two dedicated to each issue, with the first defining it and the second exploring ways to deal with the it. The chapters include the "space bar" a place for your prayer and reflection, journaling exercise, a few questions for group discussion, and links to related videos. I've been in some ladies classes where it was so hard to stay caught up with the group because of so much work outside of the meeting time. The "home work" for the book is short and to the point and can really be done as soon or as in depth as the reader want it to be done. The format is both suitable for individual or group use. I really loved hearing the voice behind the down-to-earth personality in the book. Nicole has such a great way connecting with other women that will draw them to this study. The book in itself is a great resource for women struggling with themselves.The DVD is a great addition, especially in a group setting and a great opportunity to fellowship with other women. This will surely bless many ladies groups! I will passing this along to the women's ministry at my church and wives book club. I highly recommend reading it at least by yourself and with a group if possible, or starting your own group and reading this together. For more information on purchasing, checkout the book website here. Disclosure: I received a a complimentary copy of the book for review purposes from Tyndale House. All opinions are my own.